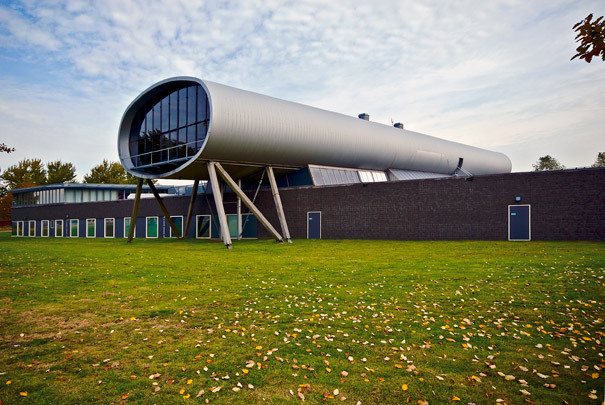 The Nieuw Land Heritage Centre focuses on the history of the new IJsselmeer polders. An oval silver tube set on a dyke, it offers views of the conquered sea at one end and the newly reclaimed land at the other. In an extension the supporting dyke was replaced by a broad plinth building containing a mix of facilities. Alongside the museum is an original farm shed from Noordoostpolder. A long timber shed of parabolic section by KCAP serves as a workshop for restoring the wrecks of old vessels excavated from the polder clay.